We have just announced the launch of Amazon Business on our German website, Amazon.de, the first country outside the U.S. where we have delivered our new Amazon Business experience for business customers. 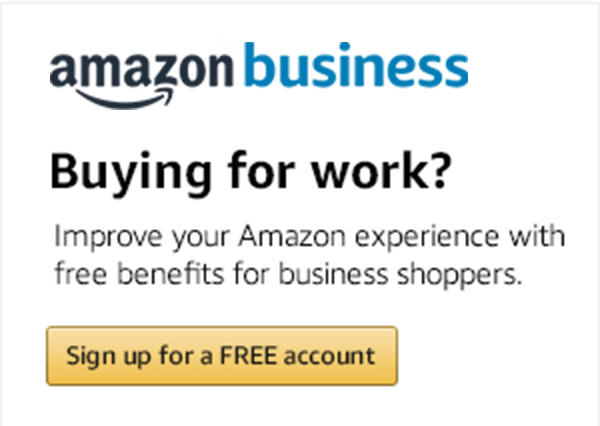 As in the U.S., Amazon Business in Germany (www.amazon.de/business) will tailor the Amazon shopping experience to the needs of business customers. This includes showing prices with and without value-added taxes, providing the ability to Pay by Invoice, and offering free premium shipping for business customers, multi-user accounts, approval workflows, and purchasing analytics. As in the U.S., we knew before launch that many of our existing customers were already purchasing products from Amazon.de to use in their workplaces. By listening to their needs, we’ve added the features that make buying at work more convenient. While we were able to learn from the programs and features pioneered by the Amazon Business team in the U.S., we are also enabling the ability to pay using invoices with 30-day terms and to see value-added-tax (VAT) pricing, two important features for business customers in Germany and across Europe. As a global Amazon team, we also realize that we have customers, suppliers and sellers whose businesses operate in multiple countries. Prentis Wilson, Vice President of Amazon Business in the U.S., has made sure our teams in Europe and the U.S. work together to listen to customer needs. As Prentis has told us, “Launching in Germany demonstrates our commitment to growing Amazon Business into a global operation. Many of our customers have businesses that span borders, and this helps us understand and better serve their needs.” Already at launch, the Amazon.de site allows customers to navigate our features in German, English, Dutch, Polish and Turkish. The Amazon.DE launch opens up access to more than a hundred million products available through Amazon Business to customers in Germany. That includes computers and IT equipment, office supplies, storage solutions, office furniture and cleaning supplies. For factories, Amazon Business offers more than five million tools, safety glasses, hearing-protection devices, adhesives, abrasives and fasteners. Restaurants can access a broad selection that includes specialty knives, pots and pans, mixers of all sizes and cash registers. Universities and labs can purchase from more than 50,000 types of scientific and lab supplies, including microscopes, test tubes and digital scales. Products range in size from titanium drill bits to industrial drill presses. Free Shipping: Free premium shipping on orders of €29 or more on millions of eligible items. Pay by Invoice: Customers can pay by invoice with 30-day terms. VAT-Exclusive Pricing and Invoicing: Businesses can see prices with and without value-added taxes and benefit from VAT invoicing. Shared Accounts: Multi-user accounts make it easy to share payment methods and shipping addresses, as well as monitor spending on the account. POs: Customers can add purchase-order or reference numbers to purchases to assist with reporting and account reconciliation. Approval Workflows: The creation of approval workflows enables better spending controls. Reporting and Analytics: Customers can gain insights into what, when and how their organizations are buying by creating custom reports. Tailored Business Experience: A unique search, browse, and shopping experience that is tailored specifically to business purchasing. Sellers on amazon.de now have the opportunity to grow their sales by reaching business customers of all types and sizes – from small businesses to large global corporations, as well as institutional buyers like universities, hospitals, government agencies and non-profits. Amazon Business launched in the U.S. in April 2015 and now serves more than 400,000 businesses. Amazon Business in the U.S. generated more than $1 billion in sales in its first year, with third-party sellers fulfilling over half of the orders. Today, more than 45,000 third-party sellers sell on Amazon Business in the U.S.
Based in Munich, Amazon.de is one of our oldest operations outside the U.S. It has been operating as Amazon.de since October 1998, and has more than 13,500 permanent employees, nine fulfillment centers and three development and customer-service centers. We offer Same-Day-Delivery in 20 German cities, and Prime Now one-hour delivery recently launched in Berlin and Munich. Florian Boehme is General Manager for Amazon Business in Germany.